The principal stadium in the capital city of Artsakh, Stepanakert Republican Stadium will be more broadly recognized as the CONIFA soccer world cup stadium, hosting the majority of matches in this year’s tournament. Let’s take a closer look at it, and at the event that will push it to the forefront of European football in the first week of June. Before we look at the stadium itself, it is important to understand a little about Artsakh. For most of the 20th century, this region on the South Caucasus was part of the Soviet Union, and coexisted harmoniously with its Armenian and Azerbaijani neighbors. However, when the Soviet Union collapsed, it became subject to bitter fighting, and was the scene of military action in the early 1990s. Today, Artsakh is a de facto nation, meaning that it has declared independence, but is not officially recognized as an independent state. However, the important thing is that peace has returned to day to day life in Artsakh, and over recent years, it has even started to develop a tourism industry. It might not sound like the most imaginative name, but Stepanakert Republican Stadium’s current moniker is stripped of the political overtones of the past, and that is probably a good thing. It was built in the mid 1950s, and was initially called Joseph Stalin Stadium, opening less than two years after the death of the Soviet Union’s most famous leader. At some point it was renamed Stepan Shahumyan Central Stadium, after a famous revolutionary of the early 20th century. The stadium was renovated in 2004, at which time it was given its current name. At this point, it was also converted to all-seater, and it has a capacity of 12,000. Further renovation work was undertaken in 2015, when the playing surface was changed to artificial turf. The stadium is home to the Artsakh national team and also hosts domestic matches. Stepanakert’s domestic team is Lernayin Artsakh FC and is one of the original teams in the Artsakh Football league. This was founded in 2004, and at the end of the 2018 season, participation increased from eight to 12 teams. The Confederation of Independent Football Associations (CONIFA) is the voluntarily-run governing body for football associations that are not affiliated with FIFA. Every year, CONIFA organizes in turn the CONIFA World Cup or the CONIFA European Cup. This year, the 2019 CONIFA European Cup will be hosted by the Republic of Artsakh. 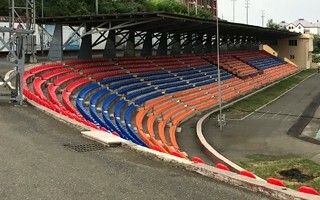 Stepanakert Republican Stadium will take central stage, and although the full schedule of fixtures has yet to be finalized, it is expected that the majority of matches will be played here. Some of the group matches, however, will be played at the stadiums in the neighboring cities of Askeran and Martakert, the latter of which has undergone significant renovation work over the past year. Last year’s CONIFA World Cup final took place in London, and it attracted an audience of 2,500. However, CONIFA’s President, former referee Per-Anders Blind, is confident that even more people will make the trip to lend support this year. As well as being an important event for Artsakh, this will represent the most high-profile tournament ever to be played at Stepanakert’s historic stadium.